Vintage Red Truck Christmas Birthday invitations for boys. 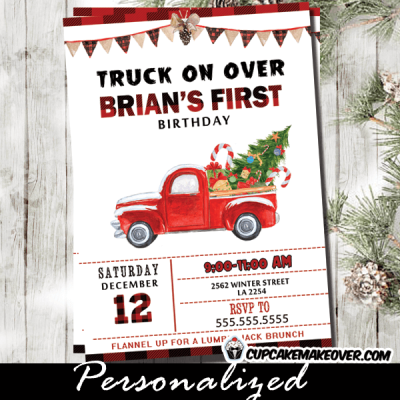 These beautiful Christmas birthday invitations feature a vintage red pickup truck carrying holiday supplies, a buffalo plaid pattern and bunting flags across the top in red and black. The perfect boy birthday invitations for a truck, buffalo plaid lumberjack, Christmas, holiday or winter themed birthday party.